Is free trade really killing the American Dream? 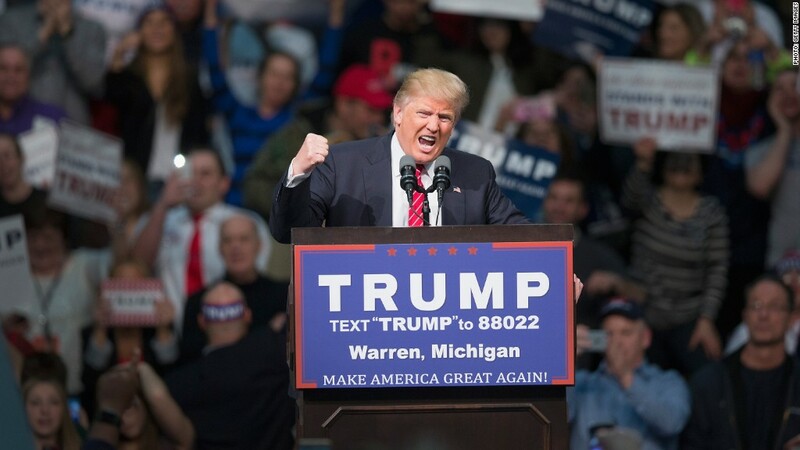 Donald Trump claims trade with Mexico and China is killing America's middle class. Corporate America says that's false. "History shows that trade made easy, affordable and fast...always begets more trade, more jobs, more prosperity," the founder and CEO of FedEx wrote in a recent Wall Street Journal op-ed. Who's right? Take a look at what has happened to blue-collar workers. 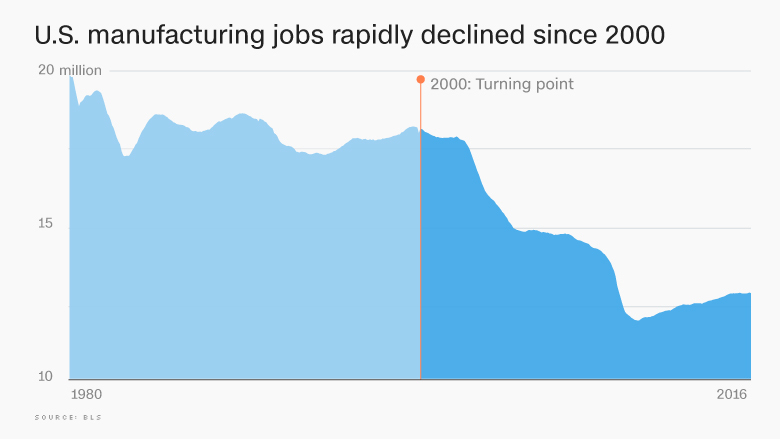 Manufacturing jobs in the U.S. actually increased in the years after the North America Free Trade Agreement with Mexico and Canada went into effect in 1994. But the story changed dramatically in 2000. Since then, the U.S. has shed 5 million manufacturing jobs, a fact opponents of free trade mention often. Trump and Bernie Sanders blame China for undercutting American workers with cheap labor (even Trump makes a lot of his suits and ties overseas). But there's another big factor: technology. Robots and machines are also replacing workers. The tech trend would have happened regardless of trade. 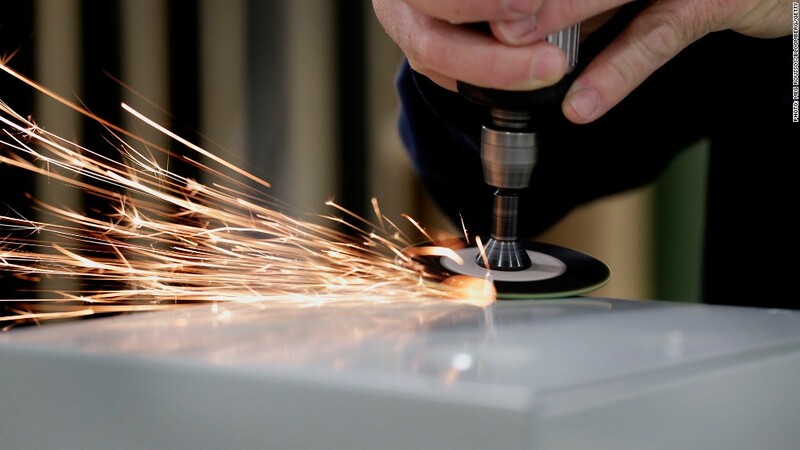 Still, manufacturing remains a key part of the U.S. economy. Over 12.3 million Americans are employed in the industry. But it's not the powerhouse it was. Trade likely sped up the shift, but many experts say it was inevitable. It's unlikely many manufacturing jobs will ever return, even if Trump's walls get built. "Trump's talk on trade is bluster," says economist Charles Ballard of Michigan State University. "Even if you did [what Trump says], you wouldn't reverse the technology, which is a very big part of the picture." Trump's threat to put hefty taxes on Chinese and Mexican goods coming into the country would likely to sink the economy into a recession. It would make many items at the store more expensive for working class Americans and spark a global trade war. The U.S. tried this tactic in the 1930s with a law known as Smoot-Hawley Tariff Act. It backfired, pulling the U.S. further into the Great Depression. The deeper question is whether the 5 million manufacturing positions that have been lost were truly that great. To put it another way, were the jobs lost really better than the jobs that have replaced them? Since the 1960s, manufacturing has always paid substantially more than the minimum wage. 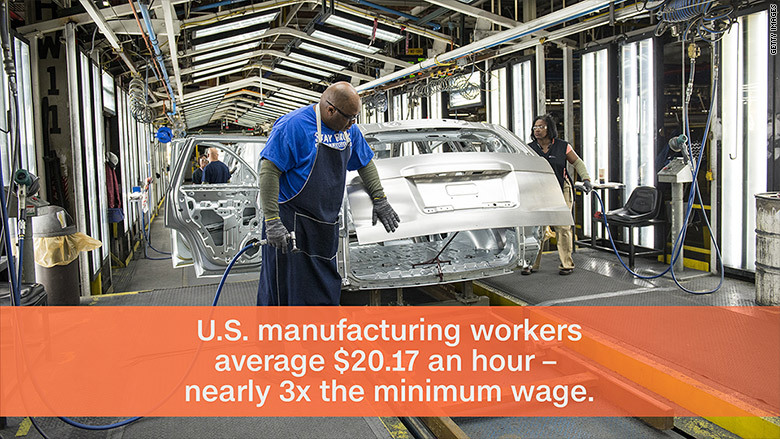 Even today, the manufacturing jobs that remain average $20.17 an hour. That's nearly three times the federal minimum wage. It's enough to vault a worker solidly into the lower middle class, although he or she still would earn less than the true middle -- $53,657 a year. Mention "blue collar," and most Americans visualize an auto worker. Someone who is middle class with a good salary and benefits despite not having a college degree. 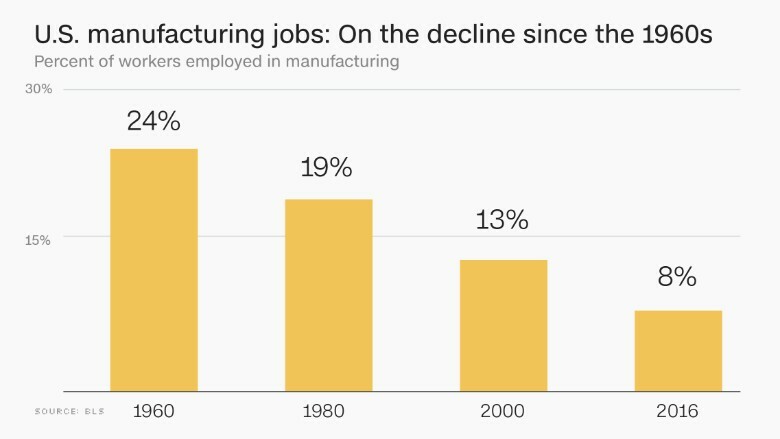 But the reality is manufacturing in America is (and always has) included a wide variety of positions. They range from clothing workers who make less than $25,000 a year on average to supervisors and plant operators who typically make almost $60,000 a year. Unemployment in the U.S. is low again because people have found work despite the manufacturing jobs disappearing. The jobs former manufacturing workers have moved into -- health care, construction and retail -- also vary greatly in pay, benefits and quality. "Certain industries have declined and others have risen," says Harvard professor and trade expert Robert Lawrence. "In aggregate, the economy is close to full employment."